Some programs require pre-registration. To register for these free programs, call 608-827-7403, email info@midlibrary.org, or stop by at the library's lower level Reference Desk. Join us as we explore and learn how to use the NEW database Creative Bug.This database is all about crafting. Use it to get ideas, patterns watch video classes, and be able to save them in one place to get back to when you need it. We will be covering basic information on how to use your iPad. We will get to know your iPad, learn to turn on Wi-Fi, learn how to use the keyboard, and install & manage apps too! Bring your iPad with and let’s explore! Meet Amanda at the Reference Desk for a one-on-one tutorial session in one of our study rooms. 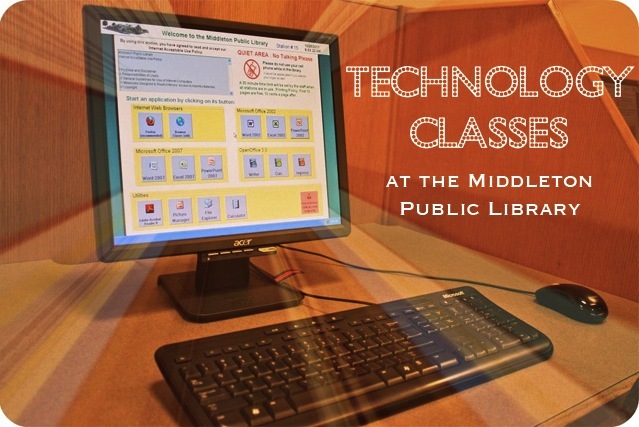 Sign up for these 30-minute-or-less computer classes by calling 827-7403, stopping by the library's Reference Desk, or emailing info@midlibrary.org. E-readers and laptops are welcome at our sessions; please let staff know at sign-up if you plan to bring your own equipment. All classes are free and open to the public! Classes run year-round; please inquire about upcoming sessions.